If you work in independent film production or mobile media recording, then the Zoom F8 is the affordable multitrack field recorder you've been waiting for. 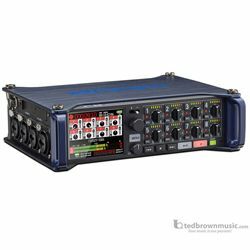 This 8-in/4 out 10 track field recorder offers low noise preamps, time-code compatibility, extensive onboard metering, and dual redundant SDXC card recording at up to 24-bit/192kHz. Multiple power sources include internal and external batteries plus AC, and the F8 even goes beyond most high-end field recorders with its included camera-mounting bracket and Bluetooth remote control via a free iOS app. Despite its small form factor, the F8 manages to offer an impressive amount of I/O. Eight locking Neutrik Combo jacks accept both XLR and 1/4" TRS input and give you the channel count you need to record stereo and surround sound simultaneously. Each of the F8's inputs feeds a separate microphone preamplifier spec'd to an impressive -127dBu EIN and capable of providing up to 75dB of gain. There's also individually switchable +24V/+48V phantom power on each mic pre, allowing you to power individual condenser microphones without wasting battery power. To quickly check levels as you're recording, just plug into the headphone jack. Monitor single or multiple tracks, including the Main and Sub outputs. The powerful 100mW headphone amplifier ensures you'll be able to monitor in loud environments.